This post is sponsored by Michael’s. All opinions are 100% mine and mine alone. I’ve been curious about how to carve a foam pumpkin for awhile now, and do I was really excited when Michaels sent me some to try, along with a hot carving knife to carve them with. I love the thought of foam pumpkins, because while they will never replace our traditional real pumpkin carving each year as a family, they can be used from year to year as decoration inside and outside of our home. I decided to try something very simple first, so I could get the hang of it, and I absolutely LOVE how it turned out. See!!! SOOOO cute!! I love the crisp, clean edges, and I know it will be beautiful when it’s all lit up. I have to admit, I was a little nervous at first, but I’m here to tell you that it really is easy, and not so scary after all! These pictures were taken late at night with my phone, which is how we roll at our house–so many projects after kids are in bed! But…you’ll get the idea. 1. 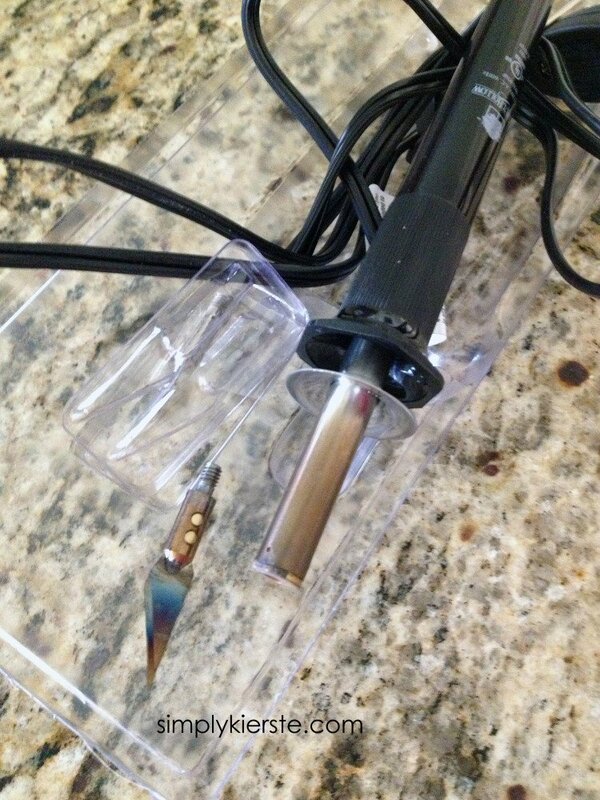 This is what the hot carving knife looks like…the blade just screws into the end, and you plug it in. It will get SUPER HOT, and it’s SUPER sharp, so this is most definitely not to be used around children, and you need to be really careful. We used a thick, wide board to lay it on, and to carve on. 2. 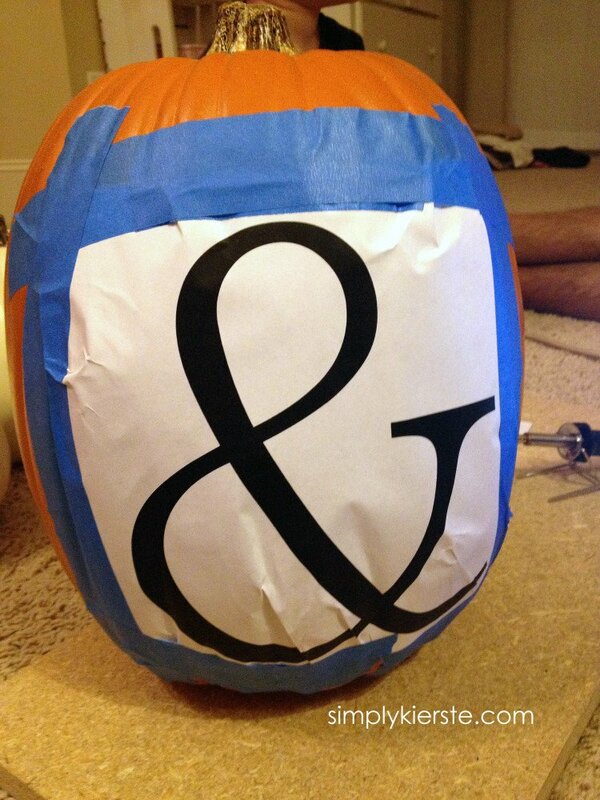 To make my pattern, I just printed it out on my computer, and then used painters tape to adhere it to the pumpkin. 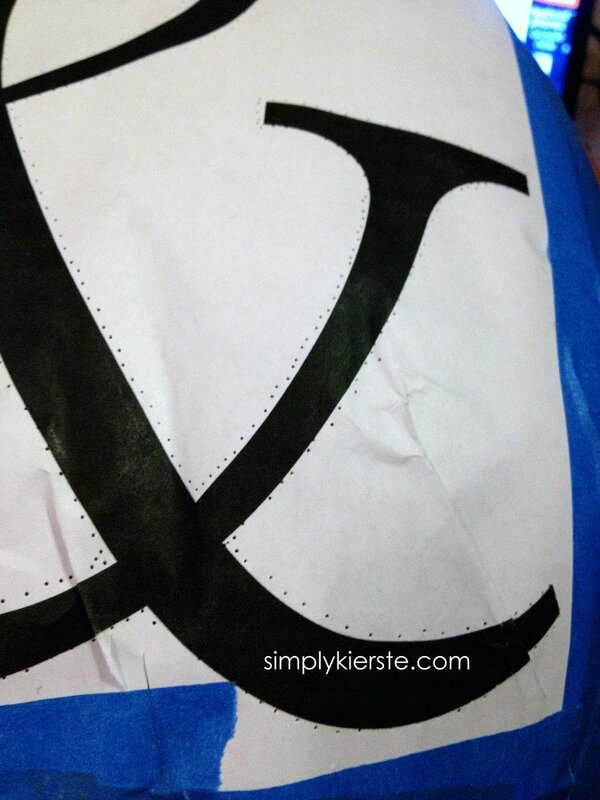 You can print a design from home, or buy patterns at Michaels, whatever you want! 3. I took my pin, and poked holes around the outside edges of the design, so I would know where to carve. 4. I removed the paper, and then traced around the pin holes with a pen, so I could see it even better. 5. Now it was time for the carving knife! Once it’s heated up, you’re ready to go. The directions say not to use excess pressure, and to leat the heat of the knife do the carving, and that is true. However, some pressure does need to be exerted, and it will take a minute to kind of figure that out. Just go slow, and follow your pattern, and it really is as easy as that! 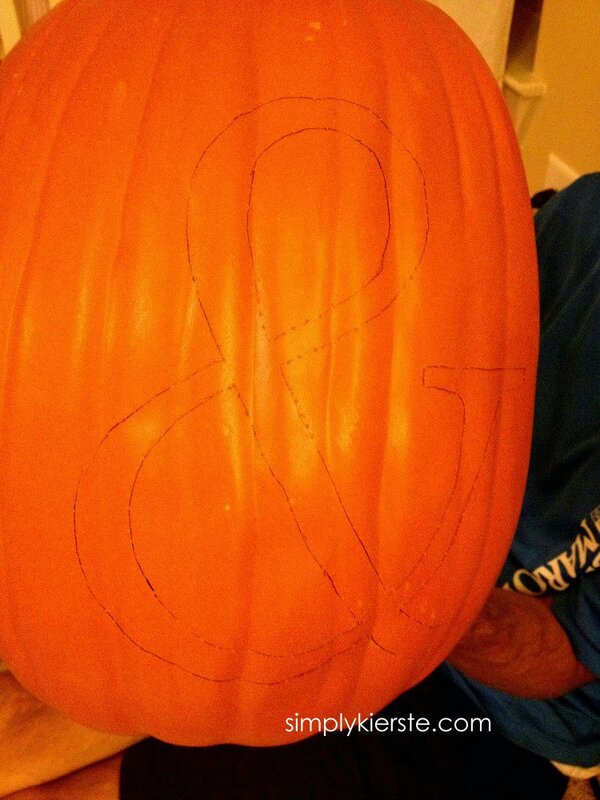 It took just a few minutes to carve out the ampersand. This knife allows even the most intricate and complicated designs to be carved cleanly, and it’s an amazing tool that I’m excited to have. 6. Once you’re done with the design, and you plan to light the pumpkin, you’ll need to carve out a hole either on the very bottom of the pumpkin, or on the back side, near the bottom, so you can slide in a candle, tea light, or battery operated tea light. If you like the look of the top cut out, like a real carved pumpkin, you could certainly do that too. The end result is just lovely, and I can’t wait to do a few more! I love that I can have darling pumpkins inside–on my mantel, hearth, entry table or kitchen table, and light them with battery operated tea lights (for fire safety!!) for really cute fall & Halloween decor. 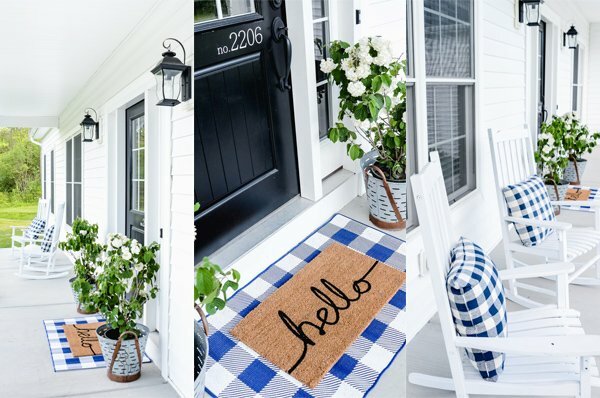 And how darling on the front porch??? 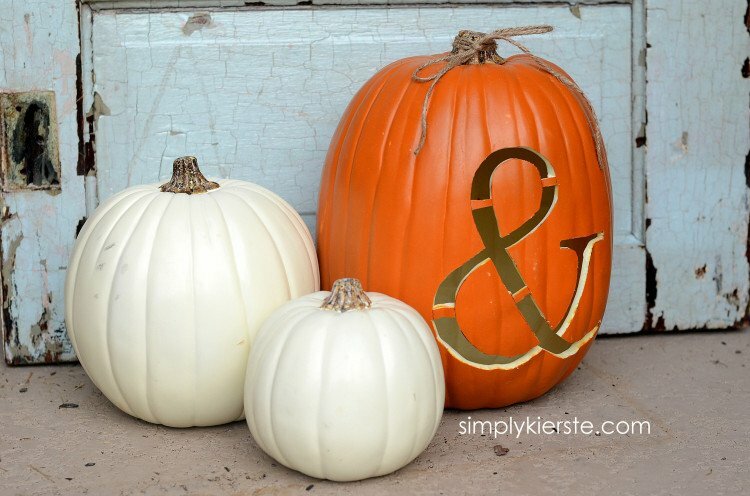 You can decorate with pumpkins for three months, without them going bad and having to toss them! 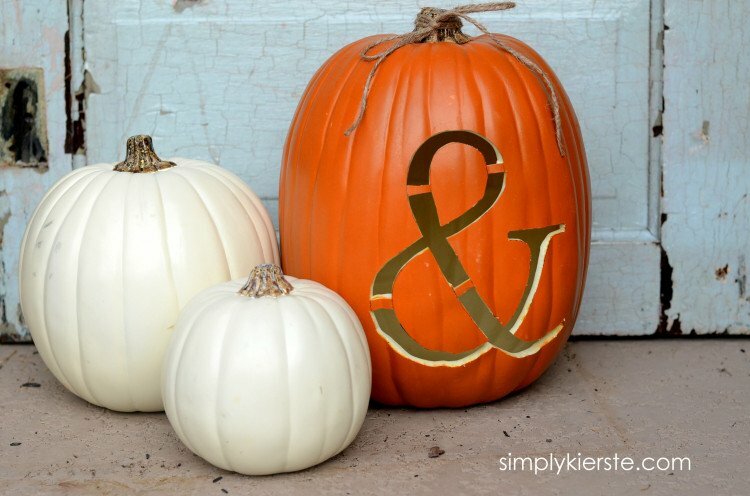 Think spooky, silly, monograms, names…the sky’s the limit!!! I love the hot carving knife idea! I did my first of these last year, and I have to say it wasn’t very easy to do with an exacto knife, especially since I did a more complicated design… It turned out really cute, but the edges aren’t as clean as on yours. Maybe I’ll get a heated carving knife for next year! Did you have any issues with the pumpkins being outside? I was thinking about using this year, but was worried about them getting wet. Ours were under the porch, so they never got wet. Sorry–wish I could help more!! That’s a great idea!! Love that it has lasted so long! !